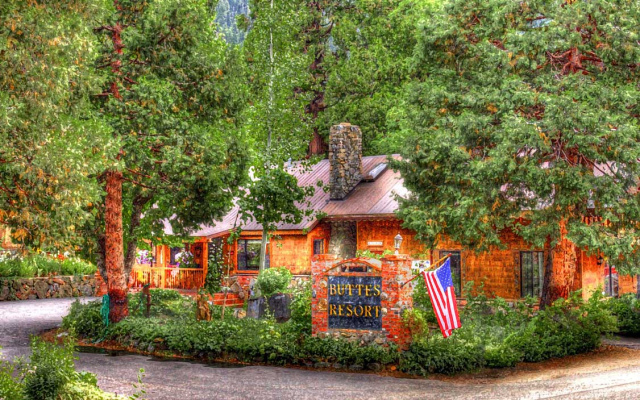 At the base of the towering Sierra Buttes lies the Buttes Resort nestled quietly above the North fork of the Yuba River in Sierra City. We are less than a mile off the Pacific Crest Trail and just 5 miles from the Gold lakes recreation area that offers countless opportunities to hike, mountain bike, fishing, swimming, ATV trails or just simply relaxing. Golfing in Graeagle is just 30 minutes away. Come up and see why we are quickly becoming the preferred vacation destination for a break from the city life. Now Open, the Buckhorn Bar and Mountain Creek Restaurant are now offering a dining option in Sierra City from May to October. The perfect compliment to the Buttes Resort and this wonderful little town. There are no dinner options available in Sierra City during the off-season. Please plan accordingly. All cabins have full kitchens and there are several BBQ's available but you will need to bring your own food for dinner or purchase it from the Sierra Country Store.